The best decisions about housing are made through reliable, objective information. For this reason, VHFA has a long-standing commitment to sharing data and conducting analyses needed to understand issues affecting the affordability of the housing occupied by Vermonters. 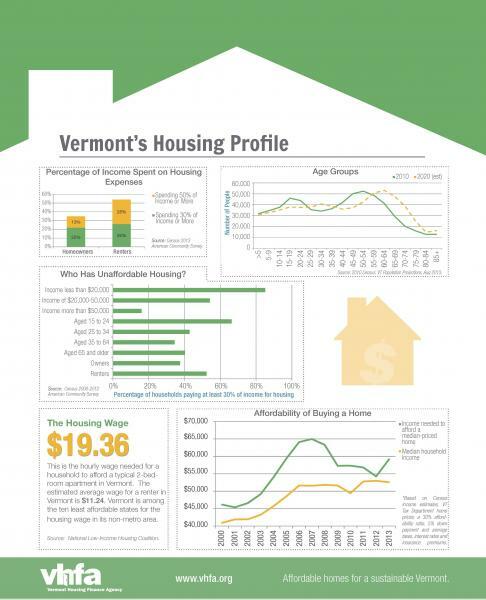 VHFA created and maintains the Vermont Housing Data website -- a user-friendly tool for Vermonters to use to learn about the housing in their communities including the availability of perpetually affordable rental housing. This site’s community profiles compare the latest information about each community’s residents and its housing stock to that of the county and state. The site’s Directory of Affordable Rental Housing provides information on every rental housing project in the state subsidized to some extent through public, project-based subsidies. >> Download the Vermont Housing Profile flyer or read more about our consulting services.